Independent Directions to this Site: From Autoroute de la Gatineau or Highway 5, going north only, take the Boulevard Fournier ramp (exit 1) north toward Gatineau. After the 0.3 km ramp joins Fournier, and you cross the 0.1 km bridge over Brewery Creek, the southern and eastern portions of Lac Leamy Ecological Park are on your right or to the east for the next 1.9 km, until you reach the Lady Aberdeen Bridge over the Gatineau River. If you are coming from downtown Hull, simply follow Boulevard Maisonneuve north until it crosses over Highway 5 and becomes Boulevard Fournier. There is a small parking area on the right or east about 1.3 km from Brewery Creek, and the main park entrance, Promenade du Lac-Leamy, is at 1.8 km on the left or east. Gatineau River West Route Directions: To reach the first site in this route from Autoroute de la Gatineau or Highway 5, going north only, take the Boulevard Fournier ramp (exit 1) north toward Gatineau. After the 0.3 km ramp joins Fournier, and you cross the 0.1 km bridge over Brewery Creek, the southern and eastern portions of Lac Leamy Ecological Park are on your right or to the east for the next 1.9 km, until you reach the Lady Aberdeen Bridge over the Gatineau River. If you are coming from downtown Hull, simply follow Boulevard Maisonneuve north until it crosses over Highway 5 and becomes Boulevard Fournier. There is a small parking area on the right or east about 1.3 km from Brewery Creek, and the main park entrance, Promenade du Lac-Leamy, is at 1.8 km on the left or east. Site Description and Birding Information: Before starting any route on this side of the Ottawa River, it is wise to check the bird line of Le club des ornithologues de l'Outaouais (COO) at 819-778-0737. This park, whose sign has mysteriously lost its "ecological", has many attractions. Trails can be found throughout. In this southern and eastern portion of the park there are two sizable islands between the mouthes of Brewery Creek and the Gatineau River which have lovely forested areas adjacent the Ottawa River. This was once Kabeshinàn, a major Algonquin encampment. Away from the river, and along Promenade du Lac-Leamy, there is more open parklike area with many larger trees. 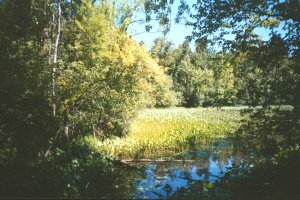 The areas adjacent the Ottawa River are among the very few remaining examples of river bottom habitat left in our area. This section of the park is excellent for migrants in spring and fall. Promenade du Lac-Leamy wends its way 1.5 km through the park to a parking lot on the shores of Lac Leamy itself. The trails in this section of the park connect easily to those in the western section. Rare bird sightings here include: Great Gray Owl (Feb. 6, 2005), American White Pelican (Jun. 2, 2007 - mouth of Gatineau River). Gatineau River West Route Directions: From Lac Leamy Ecological Park (East), return to Boulevard Fournier and head south (1.9 km from Promenade du Lac-Leamy or 1.4 km from the small eastern parking lot) to the turnoff, on the right or southwest, for Autoroute de la Gatineau or Highway 5. Follow the ramp west 0.5 km to join Highway 5. Proceed west, then north, on Highway 5 for 1.5 km to exit 3, Boulevard du Casino. Exit right or northeast via the 0.2 km ramp onto Boulevard de Casino. Turn right or east on du Casino and follow it for 0.2 km to Boulevard de la Carrière. Turn left or north on Carrière and go 0.3 km to Chemin du Lac-Leamy. Turn right or northeast onto it and drive 0.3 km past the Réno-Dépôt to the large parking lots at the next site on this route, Lac Leamy Ecological Park (West). Return to Gatineau River West. Return to Birding Ottawa Table of Contents.